In the bag? It is this month. 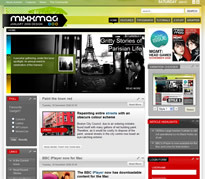 In fact if you are running a magazine site and Joomla and you want something new, up to date and possibly better than what you've already got, look no further than Mixxmag from RocketTheme. The theme is very colourful, has a focus, out of the box anyway, on music or design based sites but that is just out of the box - if you install this without the RocketLauncher package - you can make this theme into anything you want.